Wilk is Polish for Wolf and currently, believe it or not, according to a recent census, there are around 650 wild wolves in Poland right now and have been protected throughout Poland since 1998. 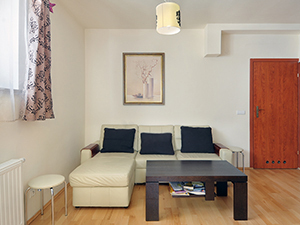 The Wilk or Wolf Apartment is a spacious flat located on the 2nd floor of an apartment complex in the South side of Zakopane. Consisting of a living room and open plan kitchen, 2 separate bedrooms, bathroom, hallway and balcony, this apartment is ideal for a family or a group of five. Clean, warm functional apartment which was great for our family of 5.TV, DVD, and stereo system to keep the kids entertained in the evening.Close to Nosal ski area.